This recipe serves 8 – I double it if we have 15 for dinner. Peel the potatoes and cut them into uniform chunks. Yukon Gold are my potato of choice because they have a natural buttery flavor. Or redskin potatoes tend to be the winner since they do make awesome mashed potatoes – and often times I’ll even leave the skins on. If you want to release some of the starch, soak your cut potatoes in a bowl of cold water for an hour or two – but that’s not a necessity and I usually don’t. Place the potatoes in a large pot, add cold water until they’re covered about an inch over. Bring to a boil, and once it’s boiling add salt to the water (you can choose not to add salt to the water, but apparently doing so increases the chance of better mashability and fluffy goodness). I also usually add a glug or two of chicken broth, and a few whole fresh garlic cloves while the potatoes boil to enhance the flavor. You can remove the garlic cloves when you drain the potatoes, or be daring and mash them right along with the potatoes. Turn the burner down to a simmer, and let simmer for 10-20 minutes – keep checking and remove from heat as soon as they’re fork-tender. If you under-cook them, you’ll end up with lumps, if you overcook them, you’ll end up with watery/mushy mashed potatoes. Now it’s time to start mashing. You can use a ricer, or a food mill, or do it the old-fashioned way with a potato masher. Mix in the cream cheese, sour cream, onion powder, salt, pepper, and butter. (Note: The measurements for the salt, pepper, onion powder and butter is just a baseline – I usually add to taste rather than measure.) Sometimes I’ll use my hand mixer at this point to make sure they’re ultra smooth, especially if I’ve used a potato masher and my arm is tired. But be careful, over mixing them will make them gummy. Transfer to a large bowl and cover. Refrigerate overnight. If you want to heat them up in your oven, preheat oven to 350 degrees F (175 degrees C). Lightly grease a medium baking dish and spread the potato mixture into the dish. Bake in the preheated oven for about 30 minutes. Or, do what I do – since the turkey is taking up all the oven space and some of the other side dishes others bring as their contribution need some time in the oven while the turkey is resting, use a slow cooker or crock pot. I spray the inside of my slow cooker with cooking spray (virgin olive oil, to be exact), and transfer the potatoes into it. Cook on warm or low for 3-4 hours, stirring occasionally. Everyone raves about these mashed potatoes, and I have to make it every year or I’d have some very disappointed dinner guests. There’s always the question of boiling potatoes – to start the water boiling first or not. Not is the best way – if you start the water boiling first, the potatoes tend to cook too fast on the outside and the inside has to catch up, which makes for either lumpy or mushy mashed potatoes. Oh, and the reason I add salt to the water after the water is boiling is because salt increases the boiling level of the water, and believe it or not, if you salt the water first, it takes longer for it to finally come to a boil. These can be made up to 2 days ahead. I usually slate the day before Thanksgiving as my day to do the ‘ahead’ stuff – that way on Thanksgiving while the turkey is cooking I can focus on any last minute things and set the table. That, and as the dinner guests start arriving, I can be socializing and drinking wine instead of slaving away in the kitchen. I may ruin my diet if I do make ahead mashed potatoes. I can control having a dessert after my work. I love to eat than sleeping. How could I resist it. My kids love mashed potatoes. Your recipe is perfect! First time I’ve heard of the chicken broth. I will add that next time I make my mashed potatoes. I thought I read somewhere that mashed potatoes should be eaten right away. oh my god, that’s the best mashed potatoes recipe i’ve ever seen! 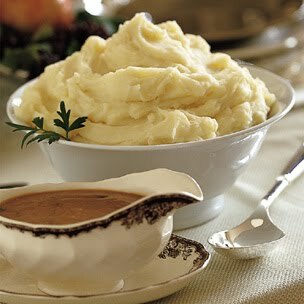 I love mashed potatoes but the picture is so beautiful and makes me don’t want to eat it. I have been making my mashed potatoes for holiday crowds like this for years. They are delish and can be made the day before. I didn’t know about the paper towels and lid – I’ll try that. I love mashed potatoes and who doesn’t when its yummy and delicious. beautiful recipe useful, good and effective mixed with the meatloaf! Every time I see mashed potatoes, I get tempted to make some potato-cutlets. Nice recipe! nice recipe.i liked it.presentation seems perfect.i will try this at home. Great tips on boiling potatoes. Who knew there was so much involved in getting mashed potatoes right. I love mashed potatoes,and I cook the potatoes,after I rinse them in cold water.They cook for about 25 mins.,then I drain them,and throw in a stick of butter,and about a half cup of whole milk,and mash them up with an electric mixer. Yes, they taught Keynes. In fact, Prof Elzinga covered Keynes in his introductory classes. They also taught the purchasing power parity theory of international prices. Like Keynes, it makes good sense in the sterile vacuum of a college classroom. Also like Keynes, it has been largely discredited outside the classroom. this is so helpful – thanks. can the potatoes be made a day ahead and then warmed in a crockpot? stick with REAL BUTTER!! margarine is not a healthier option. do you know what is in that crap? These potatoes were awesome, I added Rosemary because I love it! Everyone loved potatoes and I did make them the day before thanksgiving, great time saver!!! What temp and how long to heat up potatoes? Thanks! Thank you for the information you have provided this is very helpful to me, because this is a topic of discussion that I was looking for and finally found this website also through the Google search engine thank you from me.